ChiliCloud Pillows~Cooling Pillow for $79–$99 would be something I would be very interested to try. I wake up every night soaked in my clothes fro night sweat. I prefer it to be Cold when I sleep. I think the Chili-Gel Pillow would be good for me. Having the whole body pad would be awesome too. But at night it seems my face is what gets the hottest with the hot flashes. 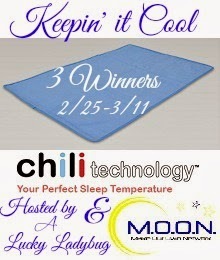 We would use the ChiliPad™ ~ Cooling and Heating Mattress Pad because I am always freezing and my hubby is always too warm!